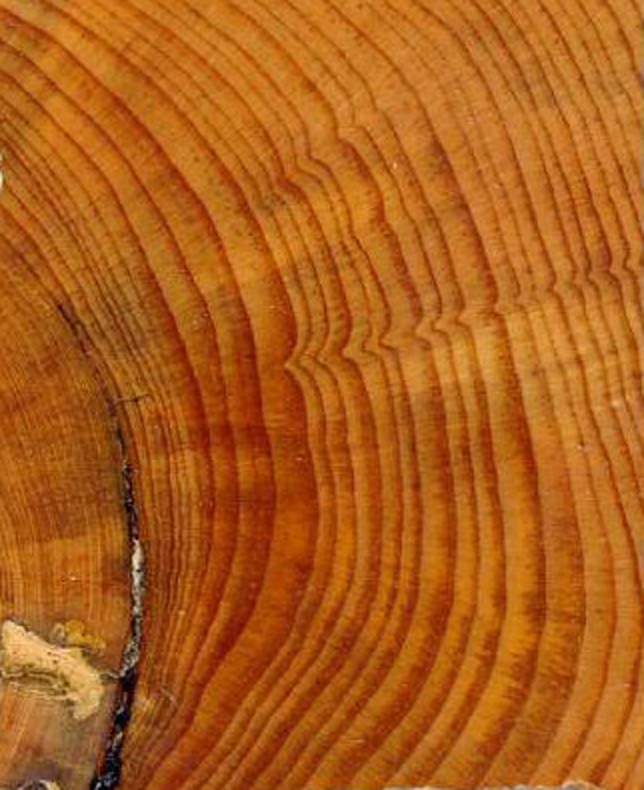 Most of us learned as children that the age of a tree could be found by counting its rings. Rings of trees growing in temperate climates can indeed tell their age through their annual rings and also help determine the age of wood used to construct buildings or wooden objects. The ages of wooden objects can be revealed by cross-dating, the process of matching ring patterns between wood samples of known and unknown ages. The underlying patterns of wide or narrow rings record the year-to-year fluctuations in the growth of trees. The patterns, therefore, often contain a weather history at the location the tree grew, in addition to its age. In dry environments, such as the Middle East or U.S. Southwest, tree rings typically record wet or dry years, and in cooler areas (high latitudes or high elevation), the ring widths are often a proxy for temperature. Archeologists have used the ring patterns in building timbers to estimate construction dates for some of the world’s most famous buildings, including the cliff dwellings at Mesa Verde National Park (nearly 1,000 years old) and the Church of the Nativity in Bethlehem (nearly 1,500 years old). The Cliff Palace ruins at Mesa Verde were built in the 1200s by the Ancestral Pueblo people, but were abandoned in the late part of the century. Photo by Ken Lund, used under a Creative Commons license. What’s in NOAA’s tree ring data base? NOAA National Centers for Environmental Information (NCEI) houses the International Tree-Ring Data Bank (ITRDB), which contains ring width data from forests worldwide, plus ring width data from old buildings, and even from rare Stradivari violins. The ITRDB contains ring width data from trees at over 4,600 locations on six continents, providing tree growth histories from around the world. New additions from field scientists are added regularly. The ring patterns of more than 6,000 trees (green triangles) have been archived in NOAA’s International Tree-Ring Data Bank. Climate scientists compare the tree growth records to local weather records. For locations where a good statistical match exists between tree growth and temperature or precipitation during the period of overlap, the ring widths can be used to estimate past temperature or precipitation over the lifetime of the tree. In many parts of the world, trees can provide a climate history for hundreds of years, with some extending back 1,000 years or more. The resulting climate histories enhance our knowledge of natural climate variability and also create a baseline against which human-induced climate change can be evaluated. NCEI archives these climate reconstructions in addition to the tree ring measurements. Tree ring data have been used to reconstruct drought or temperature in North America and Europe over the past 2,000 years. For example, tree ring based drought reconstructions for the American Southwest indicate a period of prolonged drought in the late 1200’s. 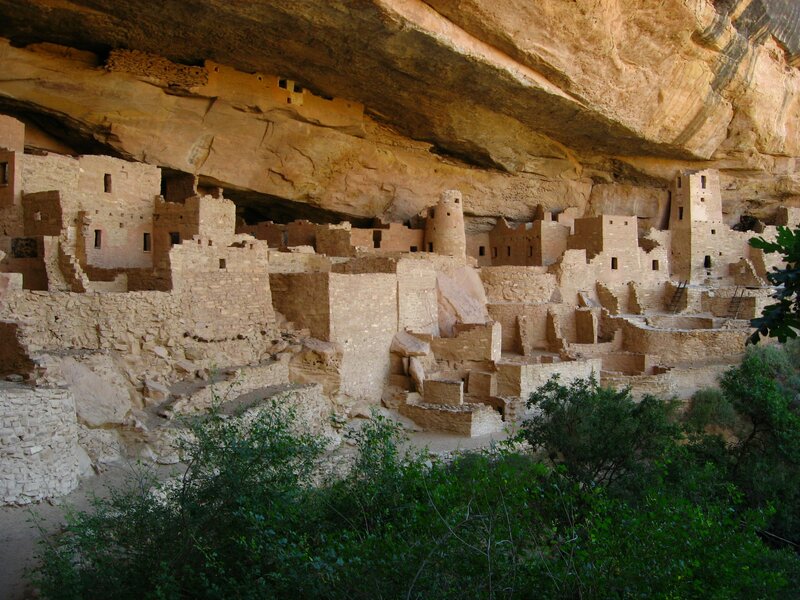 Archeologists believe that the drought was a contributing factor in the Ancestral Pueblo People abandoning the famous cliff dwellings at Mesa Verde, never to return. Severe drought in the U.S. Southwest in the late 1200s likely contributed to the abandonment of Mesa Verde (marked with open circle) by the Ancestral Pueblo people. Drought maps for the years 1275-1290 reconstructed from tree ring records show that over the 16-year span from 1275-1290, only two wet years occurred. Graphic by Climate.gov, based on summer drought reconstructions from the Living Blended Drought Atlas, courtesy of NOAA and Cook et al., 2010, Journal of Quaternary Science, 25(1), 48-61. doi: 10.1002/jqs.1303.